As we bid farewell to the first decade of the 21st century, we find ourselves poised on the brink of a remarkable new reality. The sometimes cataclysmic events of the past year have cemented, and in some cases accelerated, changes that have been taking place for some time—a gradual shift in economic and political power from the West to the East and the South and a slow realization that the United States may not always be the most powerful country in the world. Despite dawning amid the depths of the financial crisis, 2009 was a year filled with hope and opportunity. In the crucible of the financial crisis, a global consensus was forged in favor of tighter, more internationally coordinated regulation of the financial services industry. Countries and regions whose economies were expected to crumble in the credit crunch not only survived but began to thrive anew amid the ashes of the global meltdown. 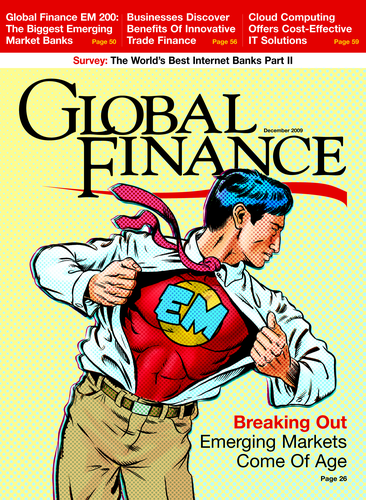 And, as we find out in our cover stories this month, the emerging markets have proved resilient and resourceful—and perfectly ready to take on the world. Many of the hopes of the past year have not yet been fully realized, though, and some of the opportunities that appeared so inspiring early in the year are in danger of slipping quietly away. While the inauguration of Barack Obama as president of the United States represented a tremendous step forward, he has been unable to push though many of his most cherished reforms. There have been missed opportunities in the financial world, too. Despite the lessons learned in the recent crisis, many contend that the entire system is still too complex, too intensely intertwined and riddled with unforeseeable risks. They have a point. Little has really changed in the wake of the financial crisis, and the calls for wholesale regulatory reform have been drowned out by the clamor of investors rushing to claim a piece of this year’s unanticipated—and potentially unsustainable—global stock market rally. It is too early to say whether the concept of global regulation will wither on the vine and whether Obama will finally make real headway with his key policies. One thing is certain, though: The emerging markets will continue to go from strength to strength.